A third-grade boy takes a test in his science class. A question asks, “What would you use to lift a grown man?” For the past few weeks, the class had been learning about simple machines. The boy really liked the subject. In fact, his father took him to the hardware store and they bought gears and pulleys and put them together. The boy thinks about this, then sketches out a six-pulley system into the small space allotted for the answer. A few days later, the boy gets the test back. A big red X is slashed through his design. The correct answer? Lever. Don’t underestimate Dintersmith. Behind the warm smile and glasses is a man on a mission. After a 25-year career in venture capital, Dintersmith is now focused on issues at the intersection of innovation and education. In the fall of 2012, he served as part of the delegation representing the United States at the United Nations General Assembly, where he focused on global education and entrepreneurship. He is now funding and supporting a range of initiatives, mostly nonprofits, which seek to improve the life prospects of youth around the globe, including Avanti Fellows and the African Leadership Academy. Dintersmith also used his time and resources to help fund and produce the education documentary “Most Likely to Succeed,” teaming up with director Greg Whiteley of One Potato Productions. The film premiered at the Sundance Film Festival in 2015 and Dintersmith will be bringing the documentary to all 50 states in the coming school year. In each state, he plans to pull together educators, state officials, philanthropists, parents and students to catalyze a discussion around the future of K-12 education. Also just in time for the new school year, Dintersmith released a book of the same name with education expert Tony Wagner, sharing insights and stories, including profiles of successful students, teachers, parents and business leaders. But what does a venture capitalist know about education? A lot, actually. Dintersmith’s career has been all about innovation and entrepreneurs. As one of the top venture capitalists in his field, Dintersmith has interviewed many people, usually for senior positions, and he had started to notice a pattern. He saw that often those with the most impeccable academic track record who had great careers at large structured companies, often floundered when they left to work at more innovative startups. ON DISPLAY: At the end of each school year, High Tech High invites parents, families and the local community to a showcase of student projects, like this gear project made by a freshman class. It seemed to Dintersmith that if the top performers in the education system were at a loss in the innovation world, something was wrong. That something is an education system that was created over 120 years ago for an economy that no longer exists. Classes based on age. Separate classes for each subject. The ringing of a school bell to denote when to shuffle to the next subject. Structure. To us that’s school. Because for over a century, that’s what school has been. This education model was specifically designed to meet the needs of the industrial revolution of the 20th century. In the late 1800s, people like Andrew Carnegie and John D. Rockefeller saw that the United States no longer needed to produce farmhands. The education system needed to be able to produce people who could follow instructions, read, write and do basic math; in other words, be good factory workers. Being creative or thinking critically was actually seen as getting in the way of being a good worker on the assembly line. The United States was the first nation in the world to take everyone, regardless of class, and eventually regardless of gender, and give those people a basic education. And as a result, for 100 years, nobody could touch America in terms of producing a workforce. This won us two World Wars and produced one of the world’s best economies. But now we find ourselves with the exact same school system, but an economy that continues to shift due to globalization and improvements in technology. According to a 2012 Associated Press report, 53 percent of recent college graduates are unemployed, or in a job that they could’ve just as easily gotten if they had skipped college. Dintersmith thinks that today, parents are pushing their kids to excel at something that’s actually going to hurt their chances in life later on. Robert Redford founded the Sundance Institute in 1981 to foster independence, risk-taking and new voices in American film. That year, 10 emerging filmmakers were invited to Sundance Resort in the mountains of Utah, where they worked with leading writers, directors and actors to develop their original independent projects. Now the Sundance Film Festival is the largest independent film festival in the United States. Many notable filmmakers received their big breaks at Sundance, including Quentin Tarantino, Steven Soderbergh and Kevin Smith. “People always ask, how hard is it to get into Sundance?” said Keri Putnam, executive director of the Sundance Institute. “It’s pretty tough.” 12,000 films are submitted to the festival every year. Out of that group, Sundance chooses 120 features and 60 to 80 short films. But Whiteley almost turned down the opportunity to work on “Most Likely to Succeed.” When Dintersmith began looking for someone to direct the documentary, he received several consecutive recommendations to hire Greg Whiteley. Whiteley is best known for his production company, One Potato Productions, and his documentaries “New York Doll,” “Resolved” and “Mit.” His work has garnered two Emmy nominations and three previous premieres at Sundance. “Right away, I thought, I like this guy,” said Dintersmith. Whiteley explained to Dintersmith that if there were just talking heads making lecture points, it would end up being a boring documentary. He needed a good story to rally the facts around. Fortunately for Dintersmith, Whiteley was a good storyteller. Although Whiteley was going from tailing a bass player and a presidential candidate in his other films to an issue-based “Most Likely To Succeed,” he had a strong passion for subject matter and he felt that, under Ted’s tutelage, he would be able to use those storytelling skills to find subjects who provided a lens for the bigger issue. For Whiteley, this particular topic was also personal. A father of two, both of his children seemed to have quit on school. While he and his wife were able to convince their son to buckle down and study hard, their daughter wasn’t buying it. Even Whiteley himself had played the game when he was a kid. School was just something to get through, and that ultimately what he wanted to do in life had nothing to do with what was going on in the classroom. CREATIVE SPACE: The original High Tech High opened in September 2000 in a newly renovated facility at the former naval training center in San Diego. Since then, High Tech High Learning has renovated buildings for five additional schools at the same location, creating a “village” of three high schools, two middle schools and an elementary school. Before Larry Rosenstock was the founder of High Tech High in San Diego, the school featured in “Most Likely to Succeed,” he taught carpentry to inner-city kids at the height of desegregation in Boston. For his students, a two-by-four was a lesson in history. The kids he taught really wanted to know why a two-by-four was actually 1 ½ inches by 3 ½ inches. Rosenstock told them that they cut the two inches down to 1 7 8 and then 1 ¾, and eventually down to 1 ½. By looking at the size of the wood used to build a house, students could determine the year it was built. Rosenstock also found that carpentry was good for teaching math. His students would have to learn basic geometry in order to build things in class, and he noticed that these kids would not only willingly learn the math, they would retain that information because they saw an immediate application for it. High Tech High is doing just that. In theory, a standardized curriculum, like those at conventional schools, makes sense, at least organizationally. What’s being taught in one classroom of a grade level is being taught in the other classrooms of the same grade level. All these kids are learning the same things, so that when they move on to the next grade, administrators can mix up the kids and their new teachers can pick up where the previous ones left off. 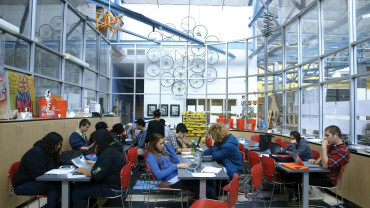 But at High Tech High, there is no standardized curriculum. The method of teaching is project-based learning, where students are given a project that involves working independently or in groups, and doing research to complete it. The projects differ in each class. While one group of freshmen might be studying an ancient play and adapting it to modern day, another might be building a model to show the rise and fall of civilizations. So kids are learning different things in each of the ninth grade classrooms? When Whiteley posed that question to Rosenstock, he admitted that it could be a problem. However, he countered with this: Studies show that when students just memorize content and then take a test, that information is not retained. Sometimes even as little as three weeks later, that content is gone. Schools like High Tech High think it’s better to get kids excited about learning a particular thing. Once they start diving into it, they learn a tool set that they can take with them into the next grade. 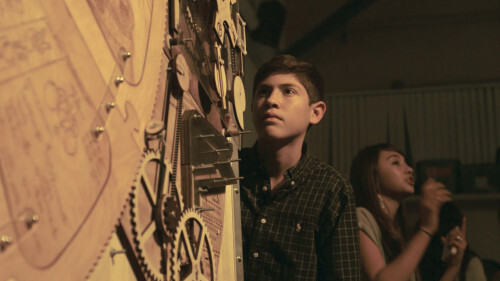 GEARHEADS: Students at High Tech High created a model to show the rise and fall of civilizations throughout history. The model was built using greats, which the students themselves constructed. That tool set can be skills like collaboration, leadership and communication, all talents today’s employers are looking for. 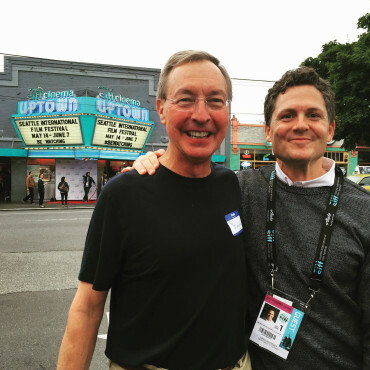 If you go back to when Dintersmith and Whiteley started working on the documentary, they said a great outcome would be getting into a major film festival. In a really great outcome, that film festival would be Sundance. And an extraordinary outcome would be great critical reviews.